Apple‘s iPad juggernaut still seem to be gaining momentum: the company announced today that it sold its one millionth iPad on Friday, April 30, just 28 days after the iPad first went on sale April 3. That’s a much faster sales rate than Apple experienced with the original iPhone—consumers took 74 days to buy one million of Apple’s original 2G/EDGE iPhone handsets. “Demand continues to exceed supply and we’re working hard to get this magical product into the hands of even more customers,” said Apple CEO Steve Jobs, in a statement. Apple just began selling 3G-enabled versions of the iPad in the United States this weekend, a move which is likely to boost overall sales now that customers can choose between a WiFi-only iPad or a version with built-in 3G-connectivity and two no-contract, month-to-month data packages through AT&T (one is limited to 250 MB, the other offers unlimited data). Apple also says iPad users have downloaded more than 12 million apps from the App Store, as well as 1.5 million ebooks from its new iBookstore. 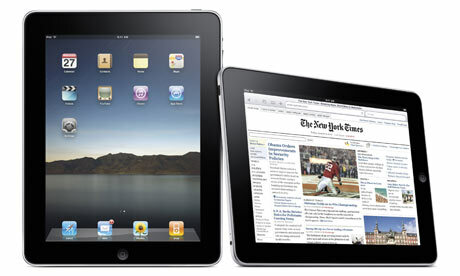 The sales momentum demonstrated by the Apple iPad is sure to spur competition in the tablet market—after all, if there’s this kind of demand for a device format that, until now, has been almost completely untested in the marketplace, there must be room for other tablet devices, right? However, anyone looking to compete with the iPad will have to compete with both Apple’s and the iPad’s substantial market momentum…and, being first out of the gate, Apple has already set consumers’ expectations for a tablet device very high.